Only 20 seconds for measurement. Compact and handy design for measurement. It is possible to measure a part gas of nose or throat by plugging Refres HR into catheter. 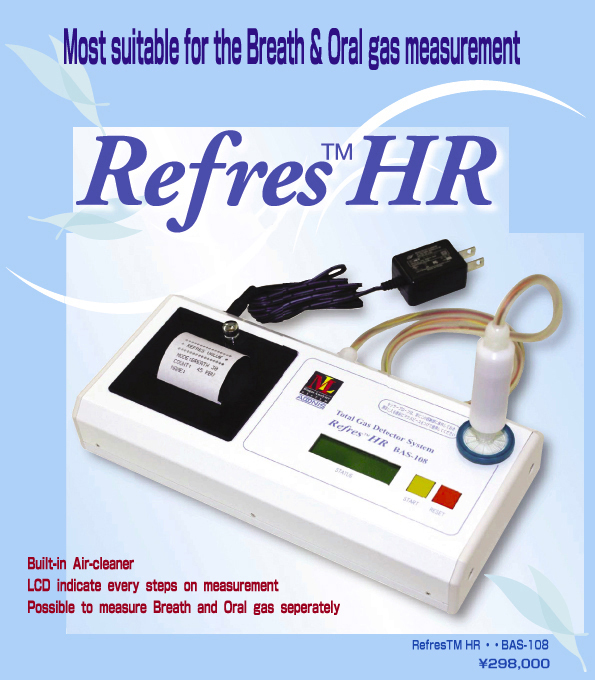 Refres HR enables you to measure a part gas of nose or throat besides breath and oral gas. You'll be able to advise properly to patients who are suffering from bad smell of mouth and nose. You'll be able to provide patients with objective data regarding breath and oral care. Refres HR will draw clients' interests , bring about motivation to have their regular medical check-ups and in particular give satisfaction to clients. Refres value indicates from 0 to 100. The value can be applied to clinical data. ( Oral Refres Value ). Normal OR value ranges from 30 to 40. If OR value becomes higher (ex. periodontitis ?), . it will be necessary to have medical care. It seems that BR value is connected with the activity of intestinal bacteria. Normal BR value ranges from 30 to 40. Smoking or having a meal may cause higher value, especially drinking alcohol shows higher value. BR value differently varies in a day. Generally, low value may be given when you're hungry. You may get high value. after a meal 2hours or so. There may be trouble in digestive organ ( constipation ? ) when BR value is always low. Also, there'll be problem in oral or other parts when high value is always shown. ☆ Many people feel their odor smell bad. REF-101 can offer objective evaluation. What concerns about breath odor is on the rise. 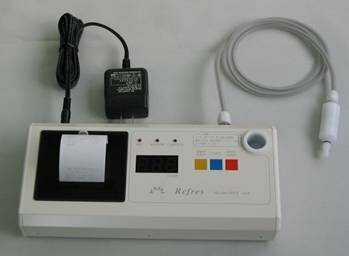 REF-101 is simple in operation and is useful for medical treatment by providing a reliable evaluation of odor. Not loss of sample gas by sensor close to mouthpiece. Result indicates 3 digits and can be printed out. 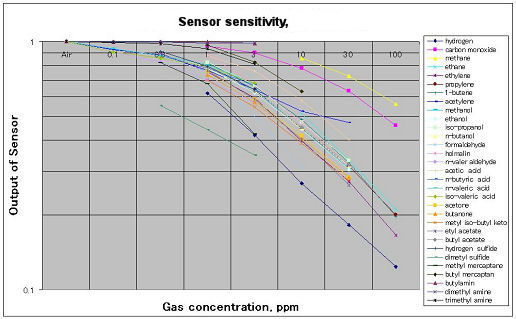 Gas sensitivity of Odor Meter, REF-101 is shown to chart below, which means that it can detect all ingredients in the breathsample, which may be differing from the odor level in your nose.